Weather-postponed races are never ideal, but who can complain when this many GIF-worthy moments occur once the action does get underway? Shortly after NASCAR Camping World Truck Series driver Mason Mingus decided to take the competition off-road by plowing into a strip of infield grass and going airborne in the American Ethanol E15 225 on Saturday morning, fellow driver Daniel Hemric slammed into a crew member on pit road. It’s not that kind of truck race, Mingus. Hemric, on the other hand, didn’t send himself flying — he sent another person. Following a series of mechanical issues over the weekend in Chicago, the final strike for the driver was bowling over his jackman on pit road while 59 laps down. After bouncing off of the windshield and hitting the ground, the guy proved just how badass he is by getting up and shaking it off. 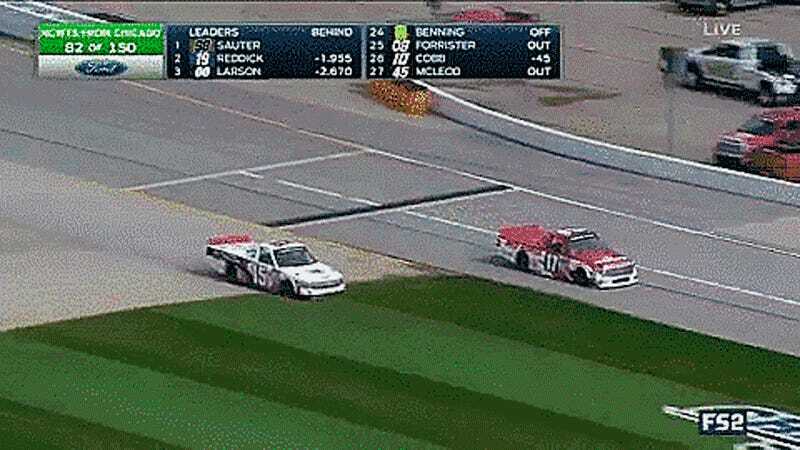 According to a tweet from FOX Sports NASCAR, everyone is okay following the incident. The one driver who wouldn’t let the potential for great GIFs outweigh the importance of actually winning the race was John Hunter Nemechek, whose fuel strategy took him to his first-career victory in Saturday’s event. But, if I had to guess, I’d say that Keselowski is glad he doesn’t know exactly how the crew member feels right now. 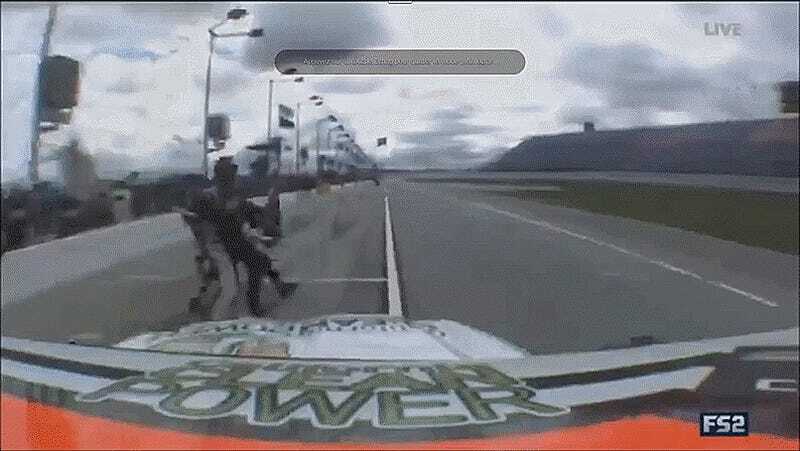 In all seriousness, we’re glad that Hemric’s guy is okay.